Extra 40% off your purchase! Don't you want? Last chance to get a great online offer from The Children’s Place Canada. Don't miss it! Entire site is on Sale! You can save between 40% and 60% from original prices. 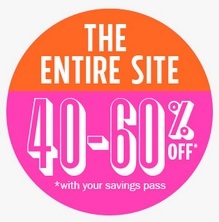 Plus, take en extra 40% off your entire purchase. It is easy, use a promo code FORTY3 at checkout and receive an extra discount. The extra discount offer ends tonight. Official source of the information is The Children’s Place Canada website. More information about the promotion on the official website.